New findings from Which and Speed Checker have revealed our super-fast internet ambitions are not as far along in many parts of the the UK as TV adverts would have you believe. 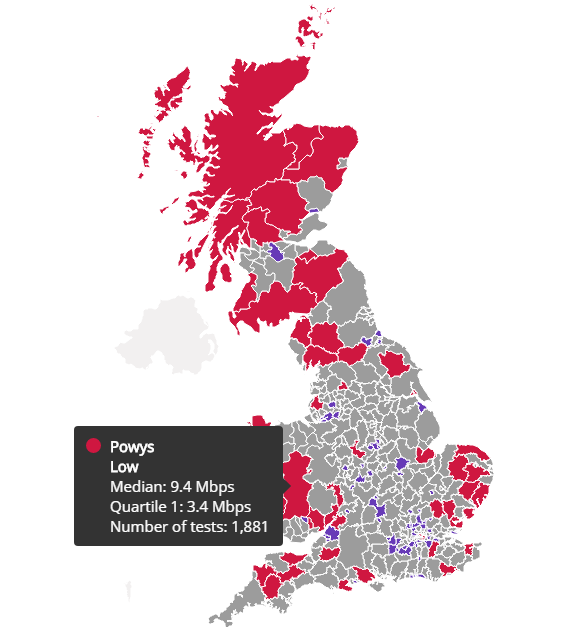 Despite a glut of advertising campaigns promising internet speeds that you won’t know what to do with, the research has highlighted a worryingly high number of regions across the UK which don’t meet minimum government requirements. Scotland would appear to be one of the worst areas in the UK for coverage, though it would appear broadband providers don’t hold any grudges against nationality, just those who live in the countryside. The Orkney Islands experienced some of the slowest average speeds, down 6.3 Mbps over 299 tests, though Powys in Wales was down at 9.4 Mbps over 1881 tests, and West Devon was only marginally better at 9.5 Mbps over 1185 tests. The map below shows a shocking number of counties which fall short of government expectations. Under the Government Universal Service Obligation the minimum recommended speed for families is 10 Mbps. “Reliable and speedy internet connectivity is critical to addressing today’s digital divide – which in some areas currently prevents families from connecting, school-children from accessing work online, and businesses from performing on a global scale,” said Phil Sorsky, Global VP of Wireless at CommScope. In truth, we shouldn’t complain too much. Yes, reaching rural communities in the UK is going to be a difficult challenge for some of the operators, but when you consider the size of the country in comparison to others, it is difficult to feel too sorry for our operators. The UK has a land mass of 93,628 mi² which pales in comparison to others. France has 248,573 mi², Texas has 261,797 mi², while the US on the whole has 3,537,438 mi². The scale of the problem here is nothing in comparison to other countries. What seems to be the problem is that investments in fibre optic infrastructure has been put off for years. Now we are beginning to see the problems, whereas other nations bit the bullet and pulled out their wallets years ago. One of the big questions does seem to be how much of a negative impact this will have on the country as a whole. Politicians have long triumphed the British capabilities in the global digital economy, as well as the potential which the connected era has for business moving forward, though they seem to have done so without the foundation of a network which can support such ambitions. “The massive inconsistencies in speeds that can be accessed across the UK highlights why the new Government’s recommitment to improving the UK’s digital national infrastructure was an important early announcement,” said William Newton, EMEA Director at WiredScore. Research such as this brings home the reality that the UK’s grip at the top of the global economy is tenuous. Without a sound and capable infrastructure, UK businesses are unlikely to be able to compete in an increasingly competitive digital environment; that is a simple fact. Perhaps the biggest question which remains is are the UK operators prepared to sink their hands into their pockets to enable this evolution into the connected era?